Rosewater marks the feature-film writing and directing debut of former "The Daily Show" host Jon Stewart. 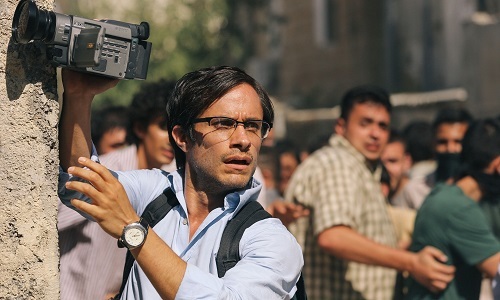 Based on the thrilling true-life story of Maziar Bahari, Rosewater follows the Tehran-born, Canadian-based Bahari as the journalist returns to Iran to interview Mir-Hossein Mousavi, challenger to Mahmoud Ahmadinejad in the country's contentious 2009 presidential election. As Mousavi's supporters were protesting Ahmadinejad's victory declaration even before the polls closed, Bahari endured personal risk by sending footage of the street riots to the BBC. For this, Bahari was arrested by police led by a man known only as "Rosewater." He was tortured and interrogated over the next 118 days, while his wife embarked on an international campaign to have her husband freed and media outlets kept the story alive. The film features Gael García Bernal as Maziar Bahari, and an international cast that includes Shohreh Aghdashloo and Kim Bodnia.